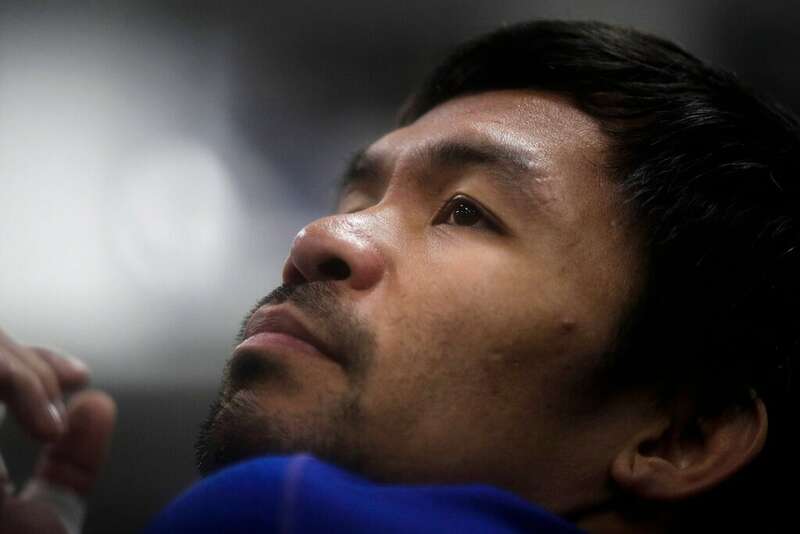 Breakfast at Manny Pacquiao's house began with a silent prayer, followed by more silence around the big dining room table as his massive entourage waited for the fighter to take the first bite. On the morning menu in the Hancock Park house were steaming plates of rice, topped with slices of beef. A helper set a few pieces of chicken in front of Pacquiao and a small plate of dried fish to go with the rice and beef he had already half finished. 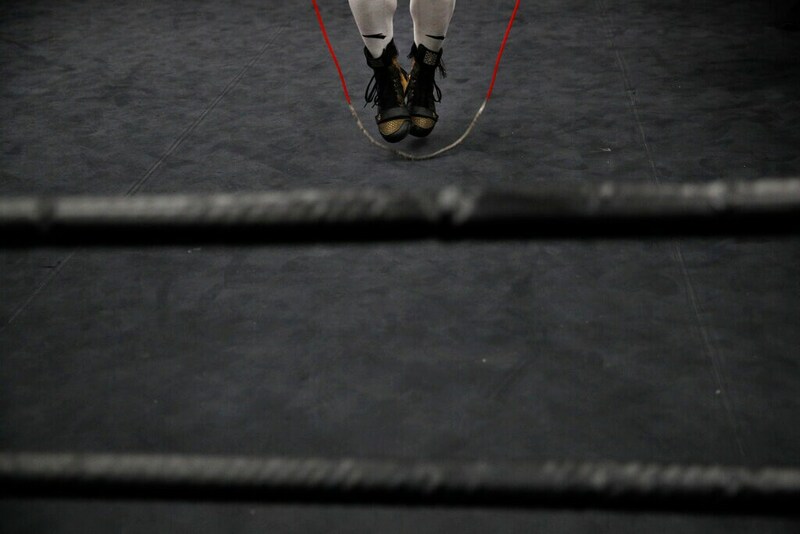 Boxer Manny Pacquiao jumps rope while cooling down after his workout at the Wild Card Boxing Club Monday, Jan. 14, 2019, in Los Angeles. 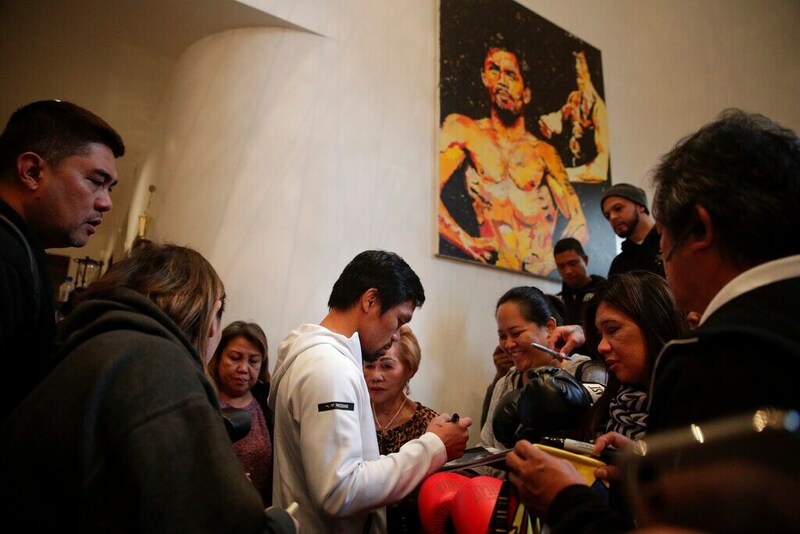 The Filipino legend is in the winter of his career, gearing up for what could be one big last fight. Saturday's bout versus Adrien Broner isn't it, but Pacquiao trains with the knowledge that a second megafight against Floyd Mayweather could possibly be just months away if all goes well. 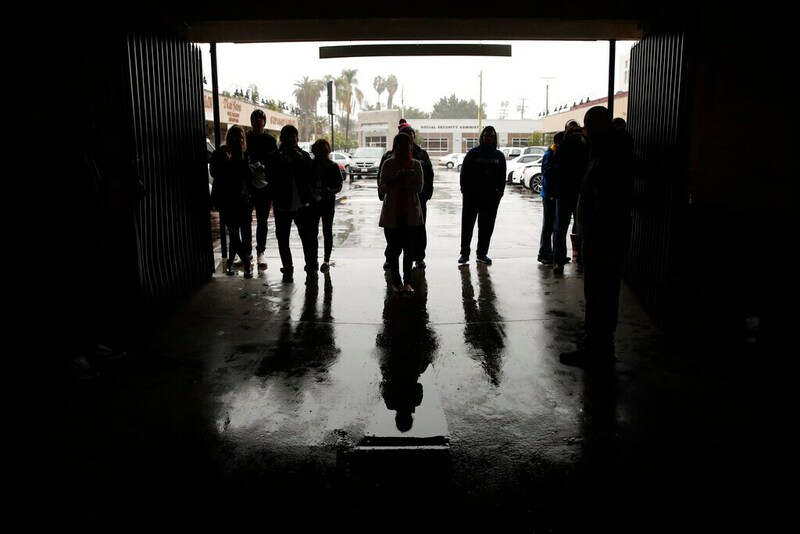 Fans wait outside the Wild Card Boxing Club for a glimpse of boxer Manny Pacquiao, Monday, Jan. 14, 2019, in Los Angeles. The Filipino legend is in the winter of his career, gearing up for what could be one big last fight. Saturday's bout versus Adrien Broner isn't it, but Pacquiao trains with the knowledge that a second megafight against Floyd Mayweather could possibly be just months away if all goes well. 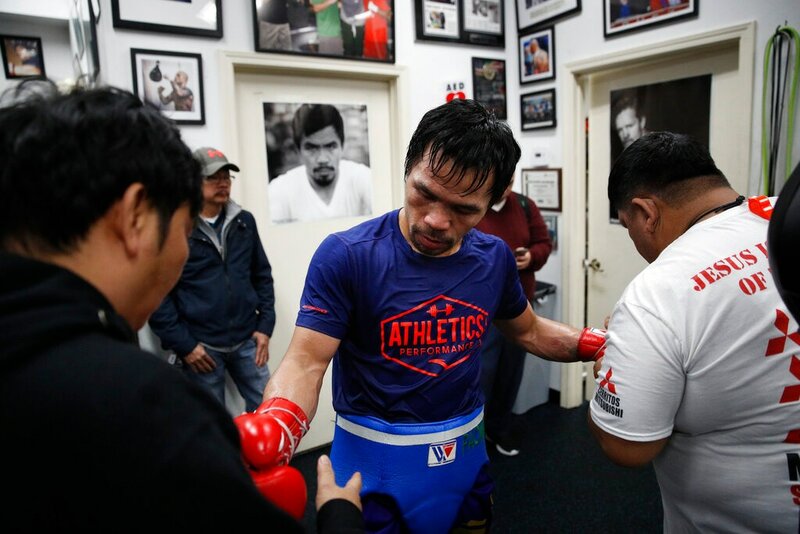 Soaked in sweat, boxer Manny Pacquiao gets his gloves removed after a workout at the Wild Card Boxing Club Monday, Jan. 14, 2019, in Los Angeles. The Filipino legend is in the winter of his career, gearing up for what could be one big last fight. Saturday's bout versus Broner isn't it, but Pacquiao trains with the knowledge that a second megafight against Floyd Mayweather could possibly be just months away if all goes well. Boxer Manny Pacquiao stretches before his workout at the Wild Card Boxing Club Monday, Jan. 14, 2019, in Los Angeles. The Filipino legend is in the winter of his career, gearing up for what could be one big last fight. Saturday's bout versus Broner isn't it, but Pacquiao trains with the knowledge that a second megafight against Floyd Mayweather could possibly be just months away if all goes well. 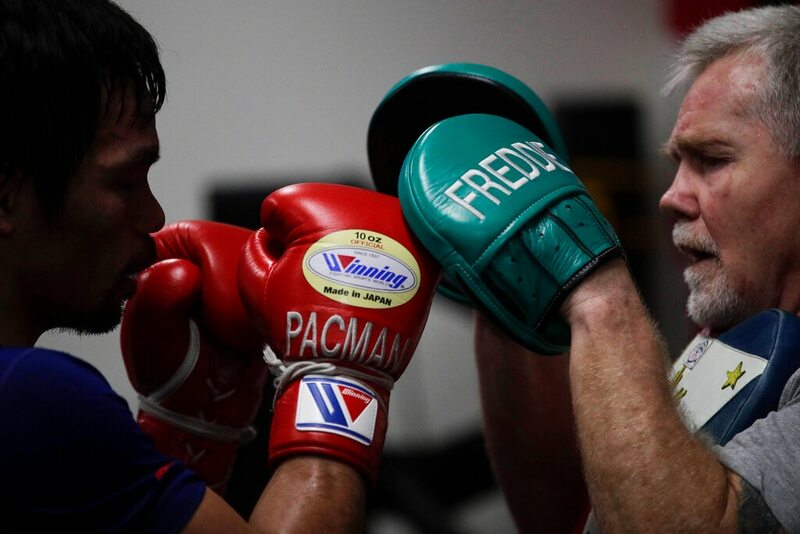 Boxer Manny Pacquiao, left, trains with Freddie Roach at the Wild Card Boxing Club Monday, Jan. 14, 2019, in Los Angeles. The Filipino legend is in the winter of his career, gearing up for what could be one big last fight. Saturday's bout versus Broner isn't it, but Pacquiao trains with the knowledge that a second megafight against Floyd Mayweather could possibly be just months away if all goes well. 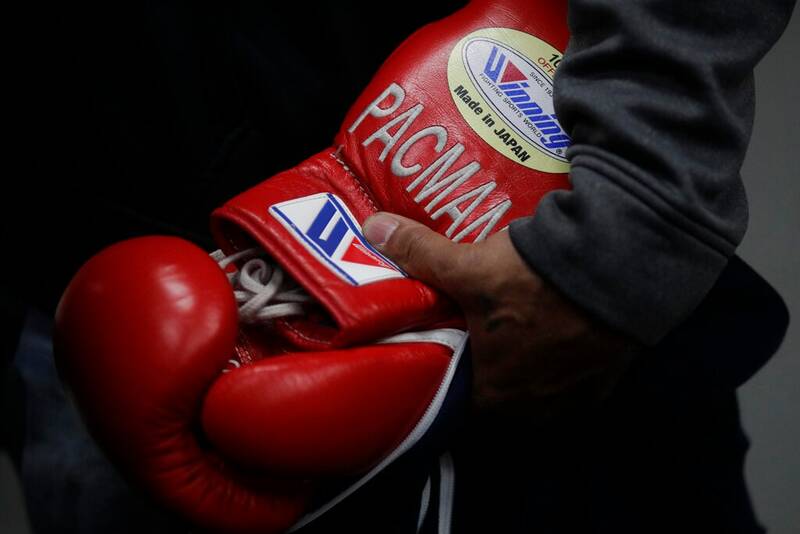 Boxer Manny Pacquiao tapes his hands for a workout at the Wild Card Boxing Club Monday, Jan. 14, 2019, in Los Angeles. The Filipino legend is in the winter of his career, gearing up for what could be one big last fight. Saturday's bout versus Broner isn't it, but Pacquiao trains with the knowledge that a second megafight against Floyd Mayweather could possibly be just months away if all goes well. 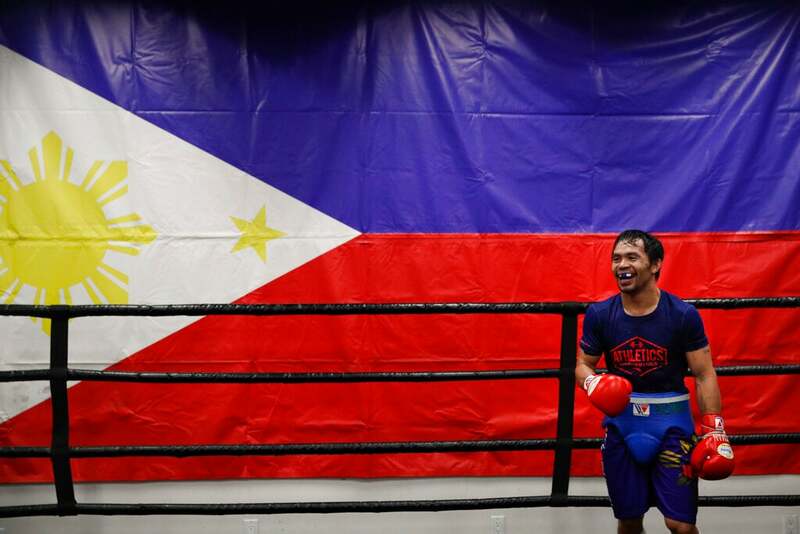 Standing in front of a large Filipino flag, boxer Manny Pacquiao smiles while training at the Wild Card Boxing Club Monday, Jan. 14, 2019, in Los Angeles. The Filipino legend is in the winter of his career, gearing up for what could be one big last fight. Saturday's bout versus Broner isn't it, but Pacquiao trains with the knowledge that a second megafight against Floyd Mayweather could possibly be just months away if all goes well. 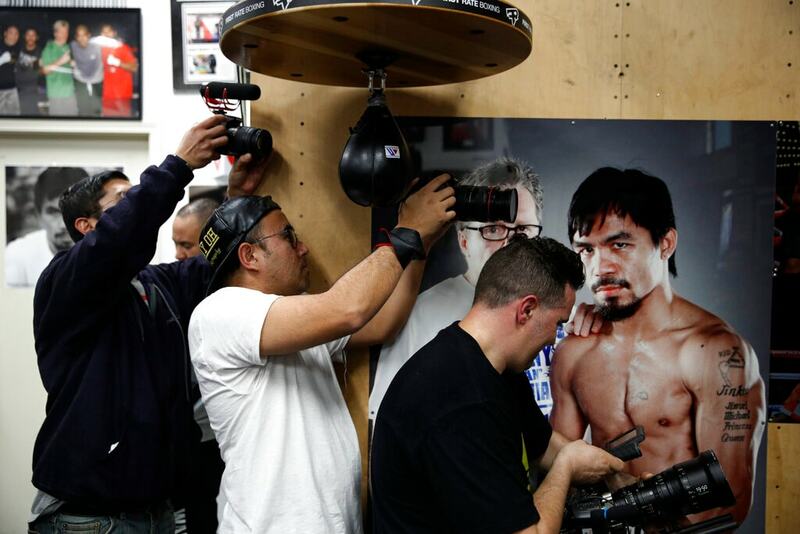 Film production crew members record as boxer Manny Pacquiao, not pictured, hits a speed bag at the Wild Card Boxing Club Monday, Jan. 14, 2019, in Los Angeles. The Filipino legend is in the winter of his career, gearing up for what could be one big last fight. Saturday's bout versus Broner isn't it, but Pacquiao trains with the knowledge that a second megafight against Floyd Mayweather could possibly be just months away if all goes well. 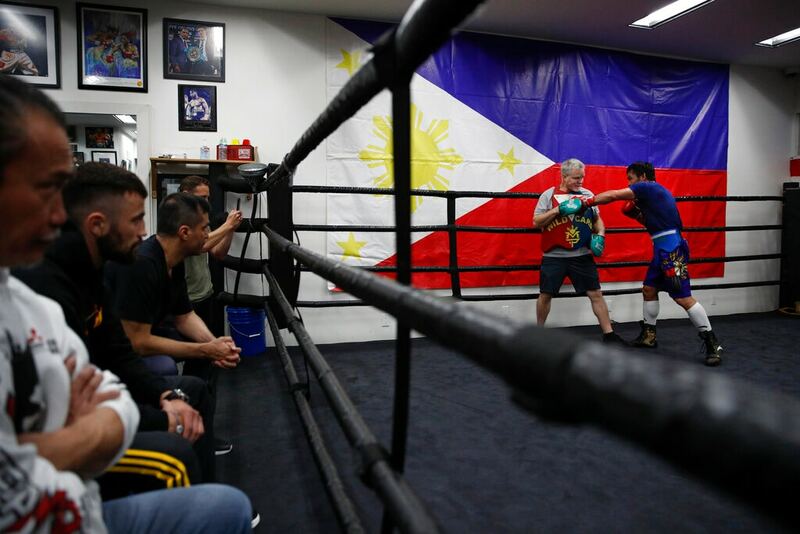 Boxer Manny Pacquiao, far right, trains with Freddie Roach at the Wild Card Boxing Club Monday, Jan. 14, 2019, in Los Angeles. The Filipino legend is in the winter of his career, gearing up for what could be one big last fight. Saturday's bout versus Broner isn't it, but Pacquiao trains with the knowledge that a second megafight against Floyd Mayweather could possibly be just months away if all goes well. Boxer Manny Pacquiao walks up the steps to his bedroom for a nap following his morning run Monday, Jan. 14, 2019, in Los Angeles. The Filipino legend is in the winter of his career, gearing up for what could be one big last fight. Saturday's bout versus Broner isn't it, but Pacquiao trains with the knowledge that a second megafight against Floyd Mayweather could possibly be just months away if all goes well. 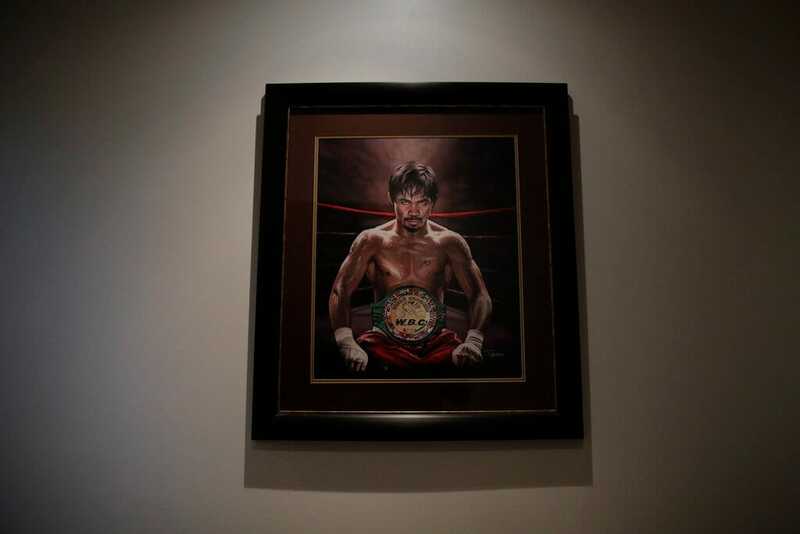 A framed portrait of boxer Manny Pacquiao hangs in the foyer of Pacquiao's home Monday, Jan. 14, 2019, in Los Angeles. 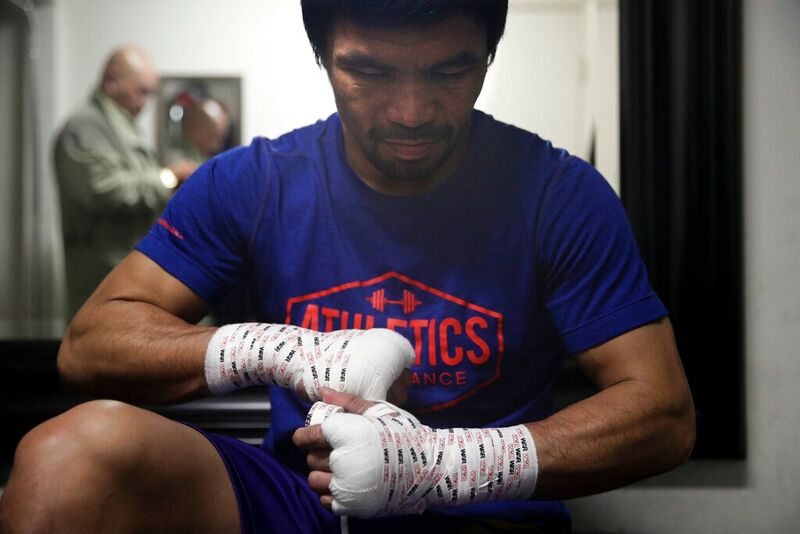 The Filipino legend is in the winter of his career, gearing up for what could be one big last fight. Saturday's bout versus Broner isn't it, but Pacquiao trains with the knowledge that a second megafight against Floyd Mayweather could possibly be just months away if all goes well.